Please refer to our stock # DFM071703 when inquiring. 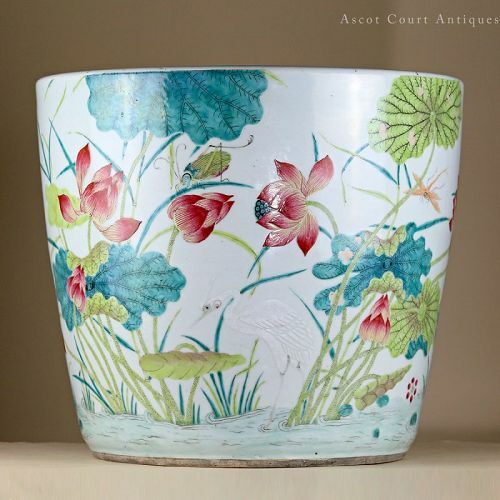 A splendid and large mid-Qing Daoguang period jardiniere, sumptuously painted with famille rose enamels throughout and bearing a panoramic scene of mandarin ducks, heron, and grasshopper in an aquatic ecology rife with leafy lotus and other flora. Characteristic of famille rose pieces produced prior to 1850, the enamels have a fresh and vibrant quality that leans slightly towards pastel shades. The painting workmanship is vigorous and full of movement; the aquatic plants seem to move with an unseen breeze. Jingdezhen porcelain decorated with continuous scenes against a simple white ground (as opposed to compositions reliant on patterned borders and cartouches) are celebrated for their painterly quality, and are typically associated with Chinese-taste porcelain made for the domestic market rather than those exported abroad. ‘Fauna in a Lotus Pond’ is a popular theme seen on Jingdezhen enameled porcelain since the Kangxi period. Please note that this jardiniere is extremely heavy, weighing 12.6 kg (28 pounds)! Due to the significant size and weight, it will not be possible to ship this jardiniere with USPS priority mail. The only alternative is UPS, but the postage will be around $200 for USA domestic and $800 for international. I'm willing to pay half of this amount for the buyer (meaning it will cost the winning bidder $100 for domestic postage or $400 for international shipping). Condition: Overall this jardiniere is in very good antique condition. There's glaze fritting to the inner edge of the mouth rim (i.e. "moth-eaten" rim). Two lotus petals have tiny touch-ups to the enamel (see photos). Due to age, there are expected surface wear and faint scratches.